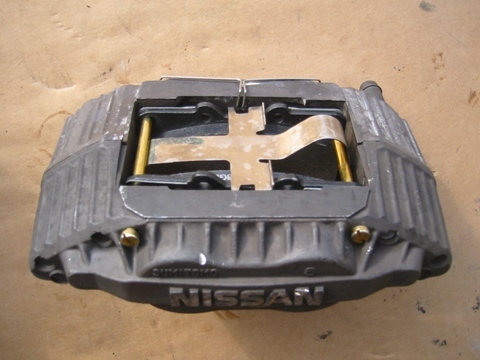 The 300ZX calipers are a popular upgrade from the 240sx, and most of the time, the calipers we get are used and worn… Not much of an upgrade if they don’t work properly, right? 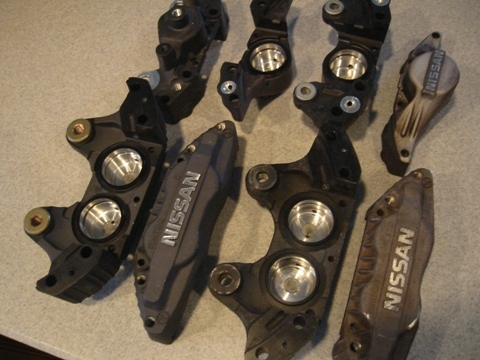 For the purposes of this article, we’re going to rebuild some aluminum 30mm Z32 calipers.The 26mm calipers can be rebuilt using the same process. Remove clip from 2 pins in the back. Pins that are holding pads will slide out from the front. 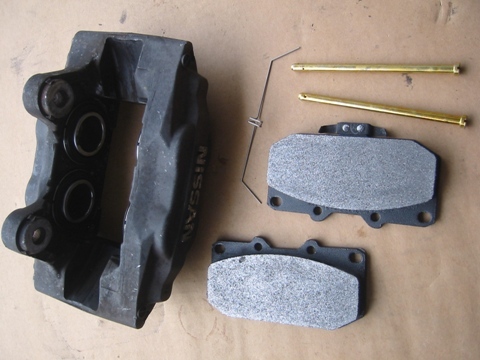 Pads, clips and pins will come out easy and they will look like this. If you just want to replace worn out or torn boots, you don’t need to go further. Just remove boots, clean up and reinstall new boots, clips and pins that are included in most rebuilding kit. 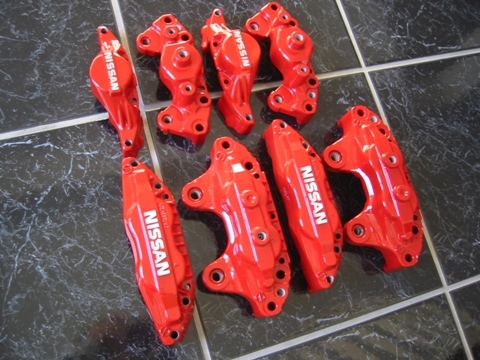 If you want to powder coat your calipers, move on!!! I used breaker bar to remove big 4 bolts in the back. 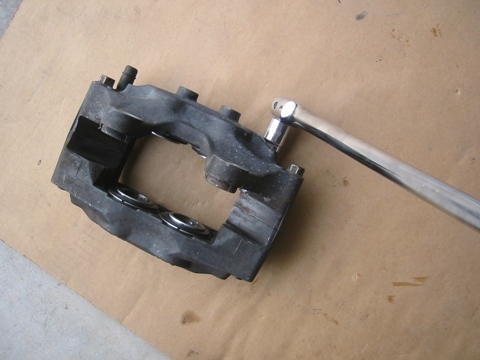 I stepped on the caliper and did this. They were bolted on pretty tight. 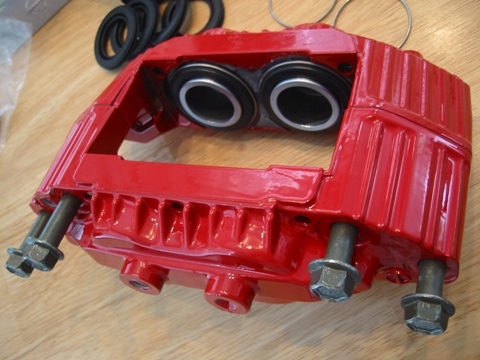 Then remove ‘O’ clips and rubber boots that protect the pistons. You will also see 2 small ‘O’ rings between two halves. Everything is out except pistons in below picture. Now, it’s time to remove the pistons. 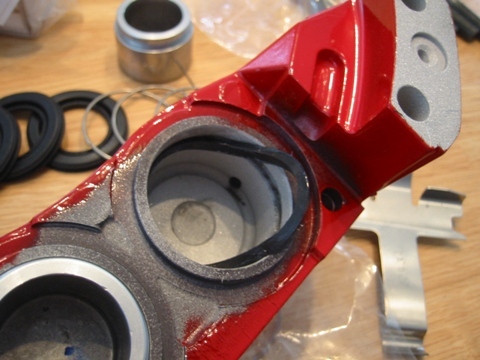 I spoke with 4 different powder coating shops and all of them asked me to take the pistons out, so I can tell they don’t want to powder coat calipers with pistons in. Front half has 2 holes and the back has 3 holes. 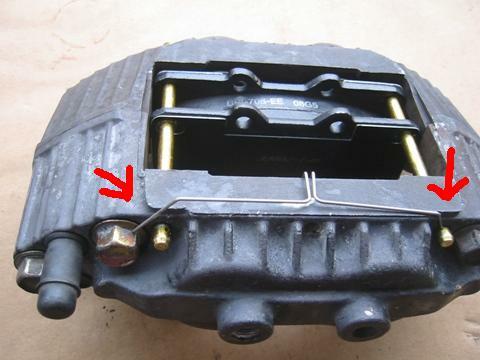 One on the back is for the brake line. You block holes and blow air in using air compressor. I used hand held 2HP compressor and it worked just fine. Get a trash can and put some newspaper and towel, so piston won’t get damaged. They will come out loud and fast. 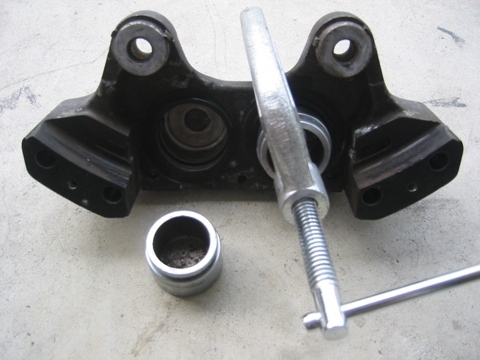 One piston will come out first, so use vice to hold that one and pop the other one. You really have to be careful here. You don’t want to get hurt. Picture of back half. 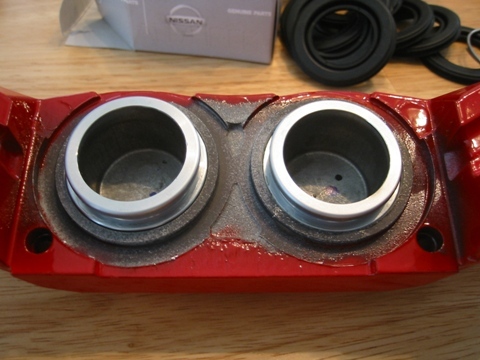 There are rubber seals in the middle of the cylinders, so don’t forget to take them out. 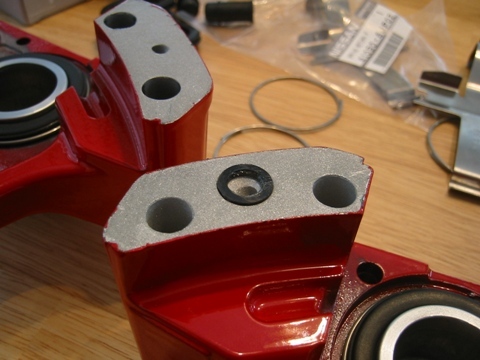 Be careful and don’t make any scratches on the cylinder wall. I cleaned them up really good and shipped these 8 pieces to powder coating shop. Came back like this one week later. 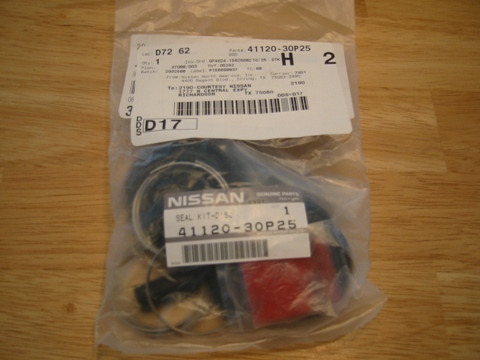 This is the kit that I got from one of our Nissan OEM parts suppliers. 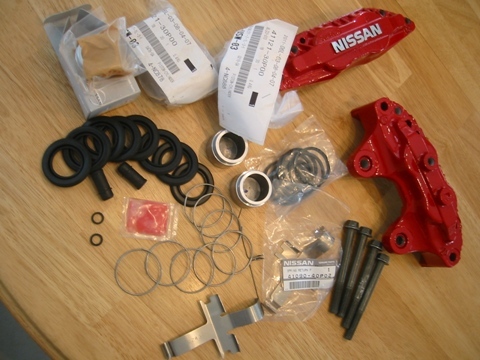 This kit should be universal for all z32 front calipers. 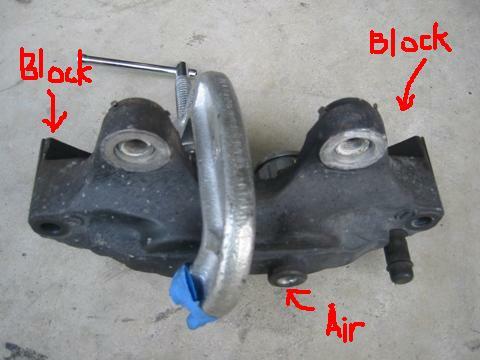 I had a used set of rear calipers, but they were in very good condition, so I didn’t buy a kit for the rear. This is the seal that goes in the middle of the cylinder. 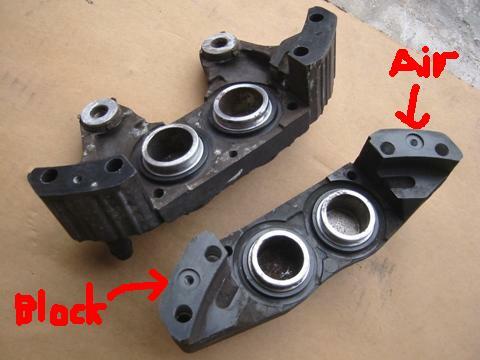 Push the pistons back in like this. Put small ‘O’ rings between 2 halves. Okay, here’s the deal. These small ‘O’ rings were not included in the kit. I saw someone bought them from ACE Hardware store though. I just reused old ones. They seemed to be okay. 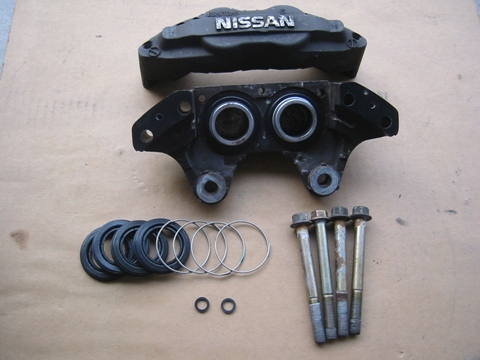 You need to lubricate all the rubber parts. Install new rubber boots, big ‘O’ clips and 4 bolts to complete.